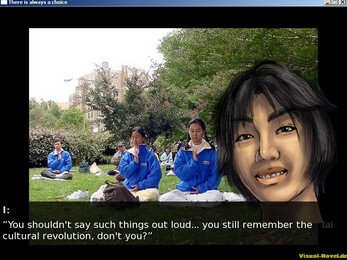 A short Visual Novel to raise awareness about the persecution of Falun Gong in China. It was originally created as an entry for the "branching story" contest held in 2009 by "Citizens for a Global Solution" (a kind of human rights organization). Since it is about human rights, the style of this visual novel is perhaps a little unusual. Instead of drawn backgrounds etc. there are real photos and the few drawings that exist are deliberately not cute. The story is based on real events (mostly an asylum application from a friend of mine) and the photos are actually taken from the persecution of Falun Gong. The names and personal information are fictitious though (the good end is also fictitious). Since there was not much time left until the closing date of the competition, there are still spelling mistakes and the game doesn't look cute or professional. The game is also not meant for children, as some of the photos are a bit shocking.